Mumbai: Mass Transit System operators such as Mumbai Metro, Delhi Metro, Indian Railways and even local buses can now issue their pre-paid cards- a move that will provide ease to the commuters. On Thursday, the Reserve Bank of India (RBI) said that mass transit system operators (MTS) has now issue a pre-paid cards wherein a customer stocks some money that can be swiped on machines instead of standing in long queues to purchase travel tickets. As of now, some of the MTS have issued pre-paid cards in partnership with banks. The RBI has said that the balance in the card issued by PPI- MTS should not exceed Rs.2000 at any point of time. Also, MTS would not be allowed to refunds cash that is stocked in the PPI. The card should have a minimum validity of six months from the date of issue. The pre-paid cards can be used at other merchants whose activities are allied to or activities that within the premises of the transit system. The regulator had received requests from various segments, including providers of mass transit services, such as, metro train and road transport services, indicating the need for PPIs catering to the requirements of this segment to enhance commuter convenience. 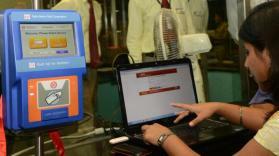 RBI said that the move to allow MTS to issue their own cards was to encourage electronic payments. “In the process of moving from cash based payments to electronic payments, the migration of micro and small value cash payments can play a significant role in achieving the vision of less-cash society. One such area where a large number of small value cash payments take place relates to mass transit systems,” RBI said issuing the new norms. The RBI said that pre-paid payment instruments (PPI) by MTS operators will be a new category of semi-closed PPI which will have to be authorised under Payment and Settlement Systems Act, 2007. As of now only few banks like State Bank of India (SBI) and ICICI Bank which has issued contactless card in tie-up with MTS operators.